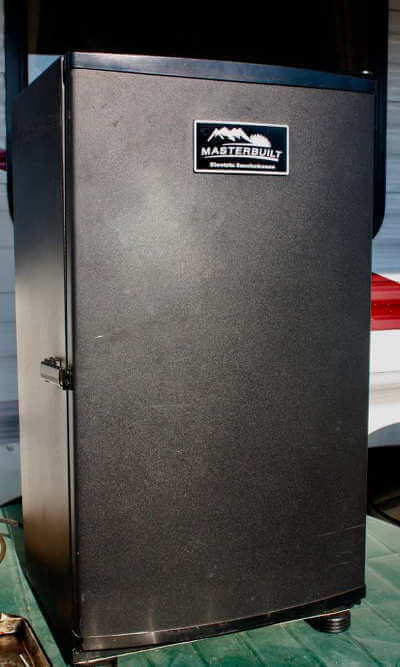 Have you heard of any Masterbuilt smokers reviews, or do you have any knowledge of them? I'm looking at purchasing a Masterbuilt Electric Smoker. They are sold at Lowe's, Cabela's, and Bass Pro. They run $169.99 for the analog and $199.99 for the digital. Is one better than the other. The digital looks more appealing for purchase and has a larger capacity, a digital thermostat and a timer. Electric Masterbuilt Smokers: Where Is The Smoke? No smoke at 225 Degrees? The recipes direct you to cook at a temperature of 225 degrees. If you keep the temperature at 225˚ the wood chips never smoke. If you turn the control to high, you will be cooking at a temp much hotter than the 225˚. Chill out, help has arrived. Don't soak your wood, you're just wasting your time. I'm a plumber and use my torch. I fill the box full and shake it down so more wood touches the bottom of pan. Meanwhile I have my smoker cranked to 450. I quickly open door and insert the pork laden racks and close the door. At this point you can leave it cranked because it won't go over 250 for an half hour or so. The meat is taking in all the heat. Now I grab my wood tray with channel locks, and torch the whole bottom of the wood tray until its smoking, and on fire. I open door quickly and put it in box. The flame dies out do to not enough oxygen, and smokes like crazy. You can leave the heat cranked for a good thirty minutes before temperature rises. Just watch it, and see accordingly. Repeat in 2 hours. Don't waste time soaking. After new chips installed, keep temperature up so the element stays on, and just don't go over 250. See ya. I marveled at that very same smoker. After reading the reviews I could not bring myself to buy it. The most common problem was the element going out and customers being told that the model was discontinued and they would not be able to buy a replacement element. I bought the Smoke Hollow 30" Electric Smoker from Gander Mountain and I am very pleased with it. It is about the same price, and I got free shipping. Do your research and compare the two. I have the digital model. Got it at Lowe's for $199, not on sale. It is great, and I have used it 3 times so far. Other reviews I've read indicate you need to keep it out of the elements. I keep mine covered under a carport when not in use. As far as cooking , it holds temperature well and has a good seal on the door. So far have smoked chicken, ribs, pork loin and sausage, all have been great. Doing a brisket and 3 whole chickens today. I've been using one of these smokers for several years now, sometimes on a daily basis. It's always produced smoke from the wood chips - I don't soak them in water. I've cooked just about everything in this smoker. Whole turkeys and turkey breasts, whole chickens and various chicken parts, pork loins, chops and roasts, chuck roasts and other types of beef roasts... even veggies like potatoes and onions. The smoker has worked pretty much flawlessly since I started using it, except for one problem. Rarely, there's kind of an explosion that happens when it's producing a lot of smoke. When it happens it pushes a blast of smoke out of the hole the wood chip insert goes into. I think what's happening is that when a lot of smoke builds up (which includes unburned, flammable gasses), a hot ember or flame from the wood ignites the gasses, causing the mini-explosion. It tries to push the woodchip insert out of the hole. But since the chip insert tube is locked in place, it doesn't blow out. If the woodchip tube wasn't rotated into the locked position, I think the tube could get partially pushed out when the blast happens. Could be a fire hazard if burning chips blew out onto a wooden deck or into dry grass. I don't know if it's a safety issue or not, but it happens rarely and the smoker is still holding up well. It just kind of surprised me the first few times it happened. I make sure the wood chip tube is rotated into the locked position when it's in the Masterbuilt wood insertion port. I've found that by using smaller amounts of wood chips (never filling the wood chip tube chip compartment over level-full), the little explosions don't occur. 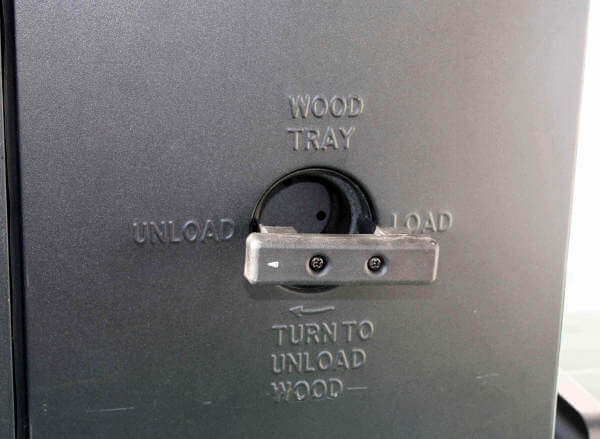 So I'll continue using this smoker, and just make sure the wood chip insert is locked into place. Today I'm going to smoke a bunch of Buffalo chicken legs. Got a bottle of Frank's Wing Sauce yesterday and will give it a try!